The Ranger RB24T truck wheel balancer is specially suited for high‐volume commercial tyre dealers and truck fleets. Most bargain brand balancers on the market are simply standard balancers with larger mounting cones. The RB24T is a real truck balancer with real fast startup and braking speeds. 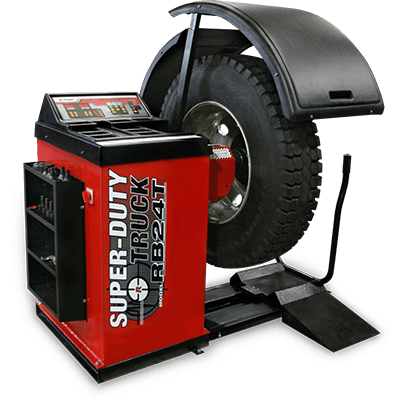 The Ranger RB24T truck wheel balancer is a heavyweight wheel balancer suited especially for high‐volume commercial tyre dealers and truck fleets. It handles tyres up to 127 cm diameter, 50.8 cm wide and rim sizes up to 76.2 cm in diameter. Although best suited for bus, truck and OTR wheels, it’s capable and fully equipped to accommodate automobiles and light truck wheels as well. Featuring Ranger’s proprietary Drive‐Check™ technology, it’s a powerful, vibration detection balancing solution that simulates road and driving speed conditions and automatically measures computer‐generated imbalance of the tyre and wheel assembly. It then recommends the most cost-effective weight optimisation correction, which minimises weight usage and maximises productivity. An integrated wheel lift easily lifts the heaviest wheel assemblies for effortless mounting on the balancer. Only available through Ranger Products, Drive-Check technology makes rotational measurements easier and faster than ever before, which means identifying and repairing unbalanced rides is now a breeze. The RB24T truck wheel balancer is extremely precise. Its software performs a driving simulation before measuring the tyre and wheel for imbalances. It also looks for run-out on the rim and tyre. Before you mount your wheel back on your truck, the RB24T’s Drive-Check ability will have identified virtually every possible complication. This wheel balancer simply makes technicians’ work easy to handle and renders more accurate results. Perfectly balanced vibration: free counter-weighted flywheel belt drive offers performance and dependability under all load conditions. Serpentine belt features a polyester‐aramid fibre composite core to resist degradation of functional performance under extreme operating conditions. A touch‐pad display panel simplifies speed entry of wheel data and helps guide technicians through balancing procedures. Operator function keys are labeled with simple, easy‐to-read icons to help identify and command all balancing functions. Bright LED weight placement indicators show weight positions as the wheel is gently rolled to exact top‐dead‐centre. A pneumatic braking system automatically engages and secures the wheel firmly in place as soon as the weight placement indicators light up. Our quick‐chuck kit reduces operator fatigue and decreases set‐up times dramatically. Installation and accuracy is not affected by the weight of the wheel, because the auto‐centring, hardened steel wheel‐holding supports lift, hold and automatically centre heavy wheels with ease. Perfectly balanced three‐jaw chuck features a forged steel body and hardened wheel‐supports and gear slides. The RB24T tooling package includes a fully equipped six‐piece cone kit for full coverage of most all wheel configurations, from cars and light trucks to super‐duty truck, bus and OTR. This well‐equipped package includes five standard cones and one dual tapered cone. Individual cone sizes: ​50 m ‐ 70 mm, 70 mm ‐ 102 mm, 102 mm - ​146 mm, ​152 mm - ​165 mm, ​171 mm - ​203 mm, ​210 mm - ​289 mm, and 273 mm - 292 mm. An integrated wheel lift helps technicians mount wheels effortlessly on the balancer, preventing potential injuries and reducing fatigue. The 227 kg. capacity push button-controlled wheel lift quickly raises the wheel to exact heights, and a bearing-mounted slider positions them for easy mounting. One-handed operation means the technicians’ free hand remains able to control the wheel assembly once it is lifted into the mounting position. Heavy wheels need power-assisted braking in order to safely reduce wheel spin. The faster the wheel starts and stops, the more increases in productivity and profits. The RB‐24T features electro‐magnetic pulse control combined with pneumatic braking to get heavy wheels stopping in mere seconds. The pneumatic braking system engages automatically as soon as the weight placement indicator is positioned at top‐dead‐centre. Automatic air brakes hold wheels firmly in place during surface preparation and weight placement operations. Upfront controls on the display panel allow you to engage and disengage the pneumatic brake with the simple push of a button.